Detroit is known for its rich history in all genres of music. Hip-Hop is yet another extension of the vast umbrella of creative minds that make up the fabric of the city. 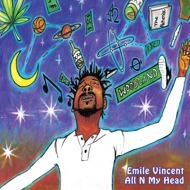 Coming straight out of 199-now with "All n' My Head" Emile Vincent champions those that came before him all while looking forward to the future of Detroit Hip-Hop. Leading with it's prolific first single "The Box" produced by DJ Dez he does just that by telling all listeners to "think outside the box" and challenge the status quo. This is one project you'll certainly enjoy start to finish!